What results do I post? You can find the summary screen of your most recent session by pressing the "Menu" button to return to the main screen, then click "select workout" > "rerow". Your session should be listed at the top. Make sure it is selected and then press the button next to what looks like a 'magnifying glass' icon along the side. Once the summary screen is showing, you can press the UNITS button to make sure the appropriate units are displayed. Another thing to note is that the monitor will only display EIGHT intervals on a single screen (and only FOUR intervals if using the "variable" programming feature). For workouts that exceed the monitors display capacity, multiple screenshots will be required. Where/how do I post my training results? Online Members should post their summary screenshot/results and comments on the GARAGEATHLETE Members Forum on Facebook. All registered members will be invited to join the group page for the duration of their membership. 1. Add a NEW POST and upload the appropriate photo (s). 2. Begin your post with the appropriate session TAG. 3. Indicate your specific targets for the session. 4. Provide some insight into your session results. How did it go? How do you feel? Remote coaching is difficult without dialogue, so please provide some details regarding your particular workout. DO NOT post multiple pictures on multiple posts! Please post ALL SCREENSHOTS and other images/video clips within the same post. Can you explain the "Session Tags"? The "session tags" allow for easy access to everyone's performances on a specific workout. It makes data analysis much quicker. Each unique tag indicates the program type (SKI, ROW, FIT), week number (W), and finally session number (S). Can I post my results on Social Media? Absolutely. You are free to upload and post your screenshots, talk about the session, etc. BUT...please refrain from posting program specifics (i.e. pacing targets, tips, expectations, session tags). The programming and coaching provided is a paid service, and I would hope that athletes following the program respect that. Do I have to complete all of the sessions? Some athletes who follow the program use SkiErg and/or rowing exclusively. Others simply use parts of the programming to supplement their conditioning as part of a larger plan. 2-3 sessions per week is plenty for the majority of people. If I do all five sessions from a program, do I have to do them in order? Although the programs are written in a specific order to balance effort and intensity during a given week, an athlete may feel more comfortable completing sessions in a different order. The program is a guide, and its implementation is flexible. Don't change your life to fit your workouts. Feel free to ask for guidance if you aren't sure how to plan your week appropriately. Don't stress. The beauty of a rolling program is that you can jump in and out fairly easily. Missing time might require some flexibility with targets, expectations, and performance, but those issues can be managed. Breaks are required; life gets busy; other things take priority. You won't "miss out" on anything if you don't complete a week or two of sessions. Your fitness might take a hit though! I am new! Where in the program do I start? Some people ask if they should look back through the program and start at the beginning. There is no need! The beauty of a continuously rolling plan is that you can start in the current week of programming. Although you might miss the front end of a specific progression, there is no reason why you couldn't jump right in (albeit, with some conservative targets to start). If you find the volume intimidating, simply contact me through the Facebook group, on Instagram, or via e-mail to discuss scaling options or additional changes to make your sessions more manageable in the beginning. I don't have a Facebook account! How do I access the programming? First of all, you are not alone...although clearly in the minority. We encourage you to sign up for an account, if only to participate in our virtual community and to get the most out of your membership. If you would prefer to stay off of Facebook completely, then simply reply to your WELCOME e-mail (once registered) and let us know so we can add you to the programming mailing list. But really, just get a Facebook account! What does "negative split" and "fast last" mean? You'll notice two things here...the first five sets are fairly close together (within 0.8 sec of each other), and each gets slightly quicker than the previous. This is what "negative splits" looks like (when the next set is slightly quicker than the previous set). The other thing you'll notice is how much quicker Set 6 is...this is a good example of a "fast last". The first 5 sets are fairly controlled, and within the pacing guides, and Set 6 has a little more "pop" to it. Negative splits and fast lasts aren't always possible. Often, performance will depend on a few different factors: how workouts were paced (too aggressive), the prescription for the workout (even paced), or how an athlete feels that day (tired, sluggish). What does all that 2k + 20 or 4k + 10 stuff mean? Indoor Rowing and SkiErg training will often pace based off of an athlete's 2000m personal record (2k), and we use a 4000m personal record pace for the BikeErg (4k). If you scroll back up to the top, you'll see a screenshot of a 2000m piece - 5:59.7 - with an average pace of 1:29.9/500m. That is the important number here, the average split, or pace. So if I was rowing or skiing at a prescribed pace of "2k +20 sec", then my target split would be ~1:49.9/500m. If the session prescribed 2k +16, then my target split would be ~1:46.9/500m. And so on. How does pacing work in the BIKE program? We provide two pacing options for our athletes to choose from, depending on the bike they use (BikeErg, WattBike, or one of the common Fan Bike alternatives like the Rogue Echo or Assault Air Bike). The first option is to complete a Functional Threshold Power (FTP) Test. We use a 20-minute test to determine the maximum AVERAGE watts. From that raw score we take 95% and use that as the athlete's FTP score. We program pacing based off of percentages of the FTP score in watts. This pacing method works for all bike types, but we find it especially useful for our Fan Bike users. Our second pacing method works for the BikeErg only. 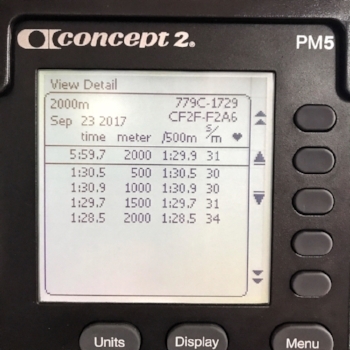 We pace similar to how we would on the rower and ski, except instead of a 2000m TT pace we use a 4000m TT pace in it's place. What does the training schedule look like for the full year? The goal of the 52-week training calendar is to balance energy system exposure and relative intensity across all three machines. The thinking behind this is to hopefully “peak” when matters most on the rower and ski. January and February are the big months, as a lot of competitions occur at this time. In rowing, “Rowd Royalty” runs four week in January, and almost all indoor rowing championships run late January into early/mid February. Finally. The World indoor sprints are early March, and signal the end of our peak season. On the SkiErg side, the Tour De SkiErg is the biggest event on the calendar (presently) and runs throughout February. The World SkiErg Sprints are held in November. There will be some obvious system cross over in terms of training if you follow both plans. Here’s the general breakdown (by cycle) from beginning of the training year to the end, with the “beginning” set around the start of February (race peak season). *2k cycle ends during first two weeks of the new training year.